In early 1987 I began discussions with distributors to service System Integrators who were begging to get the product. OEM’s tended to want a package which consisted of the host adapter and driver software for their specific SCSI device which limited our profit margins. System Integrators sold a value added product, so they would be willing to pay more for a more extensive package of software, which would drive our profits. Selling to the major disk manufacturers gave our product credibility no other product had at the time, so the integrators would be comfortable with the hardware part of the package. Selling to a few OEM’s did not involve issues of credit risk, but selling to many small integrators did. I decided that using distributors was the best solution. However I did not want to sell to small distributors, I felt it would give the company greater prestige if we sold through one of the top, major distributors. The largest industrial distributor at that time was Arrow Electronics based in New York. Around the middle of 1986 I asked people I knew in the rep business from my days at Hilevel if they could recommend someone to head distribution sales for us. The head of the local Arrow office recommended one of their sales people, Mike Shaw who was young, but well regarded at Arrow. I interviewed him as did Patty and Al. We were concerned about his youth, but we were small and it would be hard to attract (and afford) a senior sales person. We hired Mike as Manager of Distribution sales in February 1987, his first job was to sign Arrow. A company like Arrow usually did not sign very small companies, it was there name on the line also, and they had a reputation to protect. Our relationship with the major disk manufacturers, and Mike’s persistence paid off. In about three months after he came on board we signed our first major distribution agreement with Arrow in late 1987. In the mean time we were preparing new kit products for distribution featuring our host adapter product line and software The TMC-820 kit was a bare bones product with limited software designed for PC DOS only. 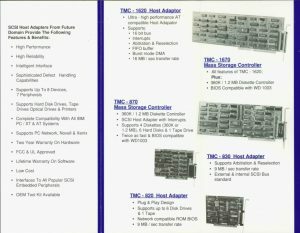 The TMC-830 product was our high end adapter with our new “Disk Maestro” software package including drivers for not only DOS but UNIX and Novell Netware. Finally, the TMC-875 adapter which included both a SCSI adapter and a floppy disk drive adapter on one card also included the “Disk Maestro” software package. In order to sell in a large distribution organization like Arrow manufacturers had to invest in sales training at all the branch offices and sales promotions. After closing the contract Mike hit the road and began training across the country. We ran promotions including a trip to Florida for top distribution sales people. Orders began to pour in.